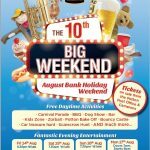 Big Weekend 2018 – everything you need to know! 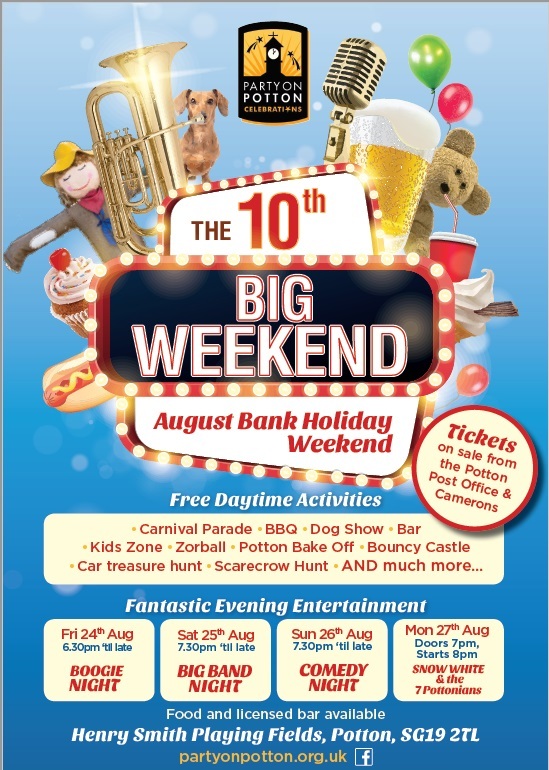 After the wonderful feedback, sheer numbers of people and brilliant atmosphere at The Big Weekend 2016 we have decided to keep the framework very similar for 2018. Each day will again be themed with Saturday 25th August being our Community day, where we invite all our local groups & clubs to have a stall and celebrate ( show off) what they do. Sunday 26th August is for all local arts and crafts people, groups and businesses to demonstrate their skills and sell their wares. Bank holiday Monday 27th August is our Sports Day when our local teams, dance troops and clubs come along showing off their skills, giving you ago and hopefully signing up some new members. Please contact us at committee@partyonpotton.org.uk to express your interest and book your stall/slot. Also if you would like to volunteer to help us (even if it’s just for an hour or 2), we need over 30 volunteers so please don’t think someone else will do it because we need you all, again please email the above address. Zorbs – bubble football, British bull dog and more…..
Sunday night this year is Comedy Night, check out the programme to see who we’ve managed to book! The Sound Express Big Band will be back once again for the Saturday night sell out evening! Following the great success of their first performance The Potton Players will be back but this time Snow White has acquired some new companions! Big Weekend Programme is out now and available here RC631_POP_Programme_2018.v4!